China’s “De-IOE” campaign is taking a bite out of some Silicon Valley stalwarts. For those unfamiliar with the term, it’s being used by tech executives to describe Beijing’s nudging of state enterprises to wean themselves off U.S. software and service firms, chiefly IBM, Oracle and EMC. The drive, which has been going on for at least a year, but accelerated after Washington indicted Chinese army officials, has dimmed the brightest star in Big Tech’s otherwise dull constellation. China is the third-largest IT market worldwide – and growing fast. Total spending on information technology should grow by about 11 percent this year to $125 billion, estimates Forrester. That’s about twice as fast as the world as a whole. The Chinese government, however, wants to switch the massive companies under its wing to domestic suppliers like Huawei and Lenovo in the name of economic development and security. American firms are increasingly left out. China only accounts for about 4 percent of sales at IBM and Cisco. At Oracle and EMC it’s probably even smaller. Apple gets 20 percent of its revenue from the Middle Kingdom. But big banks, telecoms operators and state enterprises are natural targets for U.S. snooping, and purchasing decisions are more vulnerable to pressure from authorities. Such matters don’t really affect Chinese consumers, which may explain why Apple’s sales in China expanded last quarter and Cisco’s fell by double digits. The big hardware companies face the most pain. Since China is still developing rapidly, companies and enterprises first need to buy physical gear – software and services can then be run on this foundation. Software piracy is also widespread. In the first instance, that means hardware sellers will be the first to face falling sales. It’s more about missed opportunity for software companies. IBM is particularly exposed. About half of its sales in China come from hardware. IBM’s top line in China fell 20 percent in the past quarter. Further declines lie ahead. Microsoft, on the other hand, will see what had been a fast-growing market slow, or even shrink, after China painted a target on its back by banning the installation of Windows 8 on government computers. Investors don’t seem to be expecting much growth from these tech giants. IBM, Oracle and EMC – as the acronym implies, the chief targets in China – trade at an average 20 percent price-to-earnings discount relative to the S&P 500. A substantial discount also applies to their compatriots in the crosshairs, Cisco and Microsoft. Quarterly results, which start rolling in this week, may expose a bit more Chinese pain to justify these low multiples. 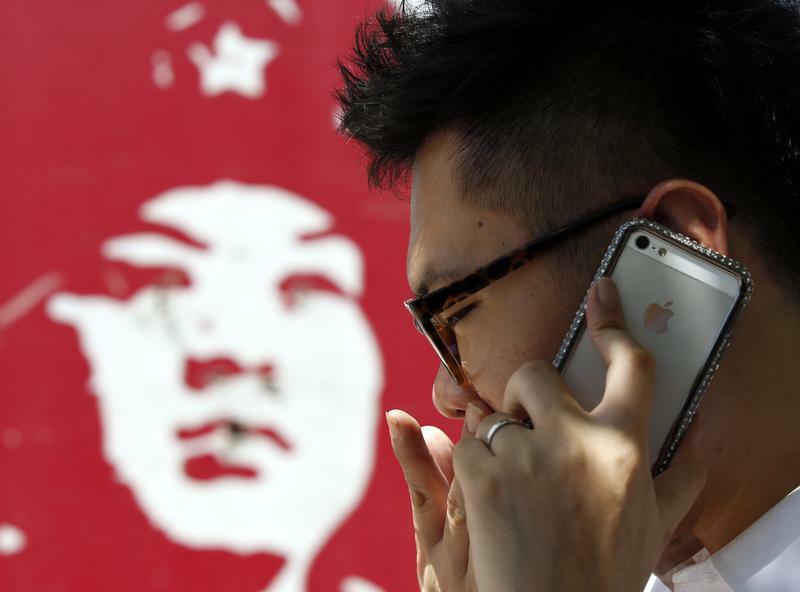 A man talks on his iPhone in Beijing July 24, 2013. IBM reports its second-quarter results on July 17. EMC and Microsoft will announce their quarterly results the following week. Cisco will report on Aug. 13. Investors are watching these and other tech companies to see whether problems in China are affecting revenue growth. In May, United States prosecutors indicted five Chinese military officials for hacking into American company websites to steal corporate secrets. Chinese state media have subsequently increased criticism of U.S. technology companies for compromising the security of Chinese IT users, and state officials have encouraged state-owned enterprises to use hardware and services produced by mainland companies. IBM’s revenue from China fell 19 percent in the first quarter.